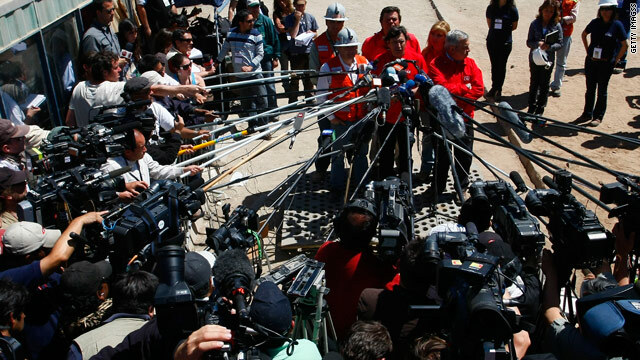 Media members surround Chile mining minister Laurence Golborne Tuesday. Interest online in the rescue has been intense. (CNN) -- The rescue of Chile's trapped miners has become one of the most-watched Web events in recent memory, according to an internet monitor. Between 4 and 5 p.m. ET on Tuesday, online news traffic grew to more than 4 million page views per minute, making the miners' rescue the fifth most-read-about online event since Akamai's Net Usage Index for News debuted in 2005. The now-complete rescue of 33 miners trapped more than 2,000 feet below the ground for 69 days is topped in traffic only by World Cup matches, Wimbledon and Barack Obama's presidential election as the top online news event. On June 24, the longest ever Wimbledon tennis match and a simultaneous World Cup soccer game set the record for most online news traffic, with 10.4 million page views per minute, according to Akamai. Obama's election as U.S. president in November 2008 was the fourth most-watched Web news event with 4.3 million page views per minute, the internet monitor says. Overall internet traffic on Wednesday was up 15 to 20 percent, according to that company's Real-time Web Monitor. On Wednesday afternoon, most of that traffic appeared to be coming from the northeast United States and Western Europe, according to a global traffic map published by Akamai. Liz Bradley, a spokeswoman for the company, said Web traffic appeared to peak when the rescues started late Tuesday at the mine site near Copiapo, Chile. "We consider it pretty significant," she said of the global traffic spike on news websites in particular. "Overall we definitely see a trend toward people going online to consume news when these kinds of events happen." This online event was unique in that the rescue was "streamed live on many sites for almost 24 hours and will continue to" be streamed on the internet, on TV and on mobile phones until all the miners were rescued, Bradley said. Late Wednesday, as the last of the trapped miners was pulled up to land, internet traffic spiked at nearly 3 million page views per minute, which was less than when the rescue missions started on Tuesday, according to Akamai. As the trapped miners ascended a cramped mine shaft to freedom, some saying prayers, hugging loved ones and tearing up upon reaching the surface, online social media sites like Twitter and Facebook lit up in discussion. Dozens of Facebook pages, both earnest and humorous, were dedicated to the miners, including "People Praying for the Chilean Miners," "Rescue the Chilean Miners" and "Valium and Whiskey for the Chilean Miners." And at least five of the top 10 "trending topics" on Twitter on Wednesday had something to do with the rescues in Chile. Facebook users in Chile posted 478 news stories per minute about the rescue at its start, and users in the United States posted 1,265 stories per minute, said Andrew Noyes, a Facebook spokesman. The online photo-sharing site Flickr highlighted images from the event. A simple rescue-the-miners game popped up on the internet. And many people also watched the rescues live via online video streams on sites like CNN.com, BBC, Ustream and others. Some news sites, including this one and Reuters, live-blogged the event, posting updates about each rescue and the ongoing effort. CNN.com served 5.5 million live video streams between Tuesday at 3 p.m. ET and Wednesday night, according to CNN spokeswoman Jennifer Martin. Those numbers are far above average, she said, but do not come close to the site's top live video event, President Obama's January 2009 inauguration, which drew 26.9 million live streams. CNN's breaking-news blog, This Just In, saw its biggest traffic day ever on Wednesday in part because of the rescue, Martin said. The blog had seen 2.6 million page views as of 3 p.m. on Wednesday, she said, and got 5.9 million hits during the entirety of the event. The Nielsen Company, which monitors Web usage and television ratings, said it was too early Wednesday to compile data on Web traffic spurred by the mine rescues. But blog discussion during the event focused heavily on the event, according to that company's BlogPulse tracking tool. CNN's Doug Gross, Brandon Griggs and Etan Horowitz contributed to this report.